We found the Nikon D800 and D800E to be wonderful cameras. But there are some reports floating around the web that the performance of the outer AF detectors is subpar. Especially with a fast and/or wide angle lens like 24mm f/1.4 or 14mm f/2.8 where it may be considered broken. Especially with the leftmost AF point. We decided to evaluate the issue with the scrutiny of a laboratory test. And to compare two samples to figure out if the issue is consistent across units or isn't. Required AF finetune adjustment value for accurate focus depending on the focus point for one sample D800/E. Required AF finetune adjustment value for accurate focus depending on the focus point for another sample. In the charts above, the "floor" represents the layout of the 51 AF sensors of Nikon's Advanced MultiCam 3500FX module. We evaluated the performance of 5 out of these 51 focus points, positioned according to the yellow bars. The larger the bar, the larger the focus error without an AF finetune adjustment. The bar denotes the required AF finetune adjustment to compensate for the focus error. Measurement done at 24mm, f/2.8, tungsten light and with 1.2m subject distance. 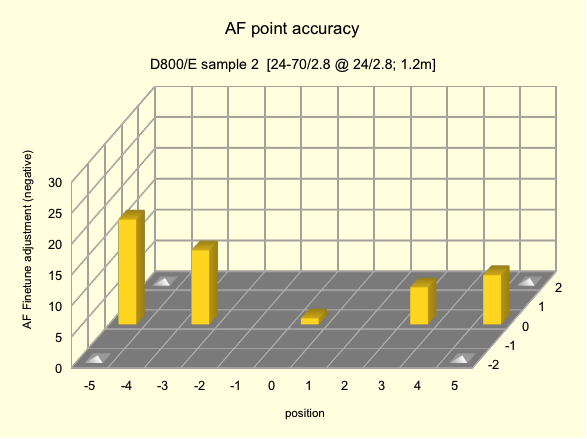 We conclude that the issue with the accuracy of the outer AF focus points of the D800 is real and probably affects all units out there to some (varying) extent. It is said to be pronounced at ultra wide angles. However, we found it to be (just) unacceptable at 24 mm as well. We guess that every camera with the "Nikon Advanced Multi-CAM 3500 FX" auto focus module is affected, i.e., D800, D800E and D4. We evaluated the characteristics of the sample variation of the issue and found that the cause may not be consistent across units. There may be a mixture of a tilt problem (such as caused by a misaligned AF auxiliary mirror, possibly independent of the focal length) and a parallax problem (such as caused by a decentered AF relay lens, possibly dependent on the focal length) where both components contribute with variable strength from sample to sample (our statements about possble causes are speculative, our statements about tilt and parallax errors and sample variation are not). Therefore, we express our concern if the issue can be cured by a simple firmware patch. As far as we can see, such a patch would require at least two additional calibration parameters. We rather see many units undergo a thorough re-calibration job at Nikon. Breaking news: According to www.nikonians.org/forums/dcboard.php?az=show_topic&forum=430&topic_id=7054&mesg_id=7054&page=#7303 , a Nikon service center has been able to calibrate the outer AF points of one unit, much in line with our findings which suggest that each camera has to be cared for on an individual basis. It remains to be seen what procedure Nikon will propose to customers in general though. Meanwhile, we recommend to be cautious when using all but the center 15 cross type AF points for any work relying on critical focus, at least on the wider end of focal lengths. As detailed in our full document (cf. above), we used FoCal software from Reikan to determine the AF adjustment values required for each focus point (we had to use a trick to work around the FoCal limitation to only test for center AF point accuracy). We actually recommend their software for normal AF lens calibration. Moreover, please feel invited to share your (then accurate) findings in the comments section. Thanks. Meanwhile, we have officially asked Nikon Germany for a press statement about the issue but have received none to date. We'll keep you posted. reporting about the status of repair attempts by Nikon Service Centers, and how Nikon Netherlands has taken a lead in the absence of clear directions from Japan yet. It becomes clear that the issue affects many, although probably not most, cameras. And that currently, a fix exists which cures most, although not all of the symptoms of the issue. But it is here I monitor the comments section. Thanks for posting your thoughts. Has a similar test been made with the D3/D3s and the D700 as a basis for comparison? @Anonymous, I don't appreciate if people don't leave a nickname at least. I can't know if somebody made a similiar test for comparison. Our testing methodology is on the table, everybody can compare to his camera of choice. IMHO, this impression isn't accurate. This is why we made the tilt/parallax distinction in the full paper. If you subtract the center point's calibration as the common adjustment, both sample 1 and 2 need about -15 extra adjustment on the left side which is similiar indeed. But they need +8 and -7 resp. on the right side which is very different (the difference is as large as the left calibration magnitude). This is almost random if you would try to adjust the right side in a firmware patch. Therefore, we don't see how a simple firmware patch could fix it. "From what I can see these samples are not too much appart. Sample 1 has to subtract to the bars the base correction (at 0). If you subtract that it becames much clooser to sample 2 and the bars became much less important. " My D800 unit, which has been shipped in March shows even worse PD-AF performance. The center PD-AF-Point works acceptable, but not as good as CD-AF used with Liveview. However almost all other Focus Points perform much worse, at about 10% to 20% performance compared to the center, while CD-AF as used in Liveview is perfect all the time. To exclude any effects by the lens I always compare resulting sharpness at the focus point that has been used. I've also tested different lenses (50/1.4G, 24-70/2.8G, 24-120/4G all at around 50mm). 1. Select a focus point in AF-S mode at the camera, defocus the lens, then focus and shoot from the software. 2. Switch to Liveview in the software, then focus and also shoot from the software. Note the new focusing that is always done by camera and the focus is set to where the AF-Point was set in the previous shot. Using Reikan's Focal Pro Software Version 1.5.1 allows to compare the performance of all AF-Points, so I confirmed (and documented) the remarkable fact, that in my unit not only the outer focus points but also the direct neighbours of the center AF point (14 of the 15 cross type AF points) are affected. Not using this camera every day until recently I had believed that my poor shooting technique where to blame for all those wide open shots, that where out of focus. Now with this software I learned differently and will use it also to check the performance of Nikon Service to repair my camera. I'm happy to provide any more data, should it prove useful for others. You can compare for yourself by looking at the following 100% Crops taken with the 24-120/4G, disabled VR at 50mm, 1.5m distance to subject, 1/50s and f4 with camera ans subjekt not moved in between shots. I'll comment as soon as Reikan has released a forthcoming version of FoCal which avoids some problems with interpreation of results in the current version. We're working on this. Meanwhile, I have no doubt that there are D800s performing betetr (or worse!) than the ones evaluated in our study. After all, the two cameras we studied have been random selected.